There are various problems with the series, the most obvious being that it compares apples with oranges and also with screwdrivers, meaning that the different maps present different data-sets. Some of the data-sets themselves are inaccurate. Judging by the picture above, your version of the maps is even more problematic than some of the other versions which are out there. I'll relate to your version as presented on Mondoweiss. First, the map from 1946. Even standing alone without the series, it's misleading in that it contains two distinct types of information. The outline is of the territory controlled by the British, commonly known as Palestine. Being a map of a political entity, however, the whole thing should be the same color, green in this case, since the entire territory was ruled by the British, the white parts and the green. If one wished to show privately owned land under the sovereignty of the British according to ethnic identity, the green would have been replaced by a hodgepodge of colors. Some of the land was owned by Jews, some by Arabs (today we would call them Palestinians), some by Arab absentee landlords of other nationalities (Lebanese, Syrians, Egyptians and so on), some by European churches – Catholic Protestant, Greek Orthodox, Russian Orthodox and others, and finally, the largest section by far would have been land registered by no-one and thus belonging to the government, i.e the British. As far as I can see, your version has omitted the Jewish ownership of property in Jerusalem (where there was a majority of Jews), and in various pockets such as the Etzion Block, Neve Yaacov, settlements on the Dead Sea, Hebron, Safed, Naharia and its hinterland, Kfar Darom in Gaza, and so on. But the main problem with this map isn't its omissions of Jewish property, but rather the implication that any land not owned by Jews was "Palestine". Not true. If it's land ownership you're trying to depict then most of the territory was owned by the British government; if it's political sovereignty then the entire area was British. The second map drops the issue of land ownership, and the series never returns to it. This map is a reasonably accurate depiction of the partition plan adopted by the United Nations on November 29th 1947, with one glaring omission: the Jerusalem-Bethlehem area, which was very clearly not allocated to either side, but designated as a Corpus Separandum. I emphasize: Jerusalem and Bethlehem. So the cartographer has allocated to a notional Palestine a very important piece of territory which it never had. Of course, this map never depicted a reality. At the time it was rejected by all the Arab states which had a vote, and also by the local Arabs themselves who did not generally call themselves Palestinians at the time, but we can agree to call them that now. I'm not going to get into the question of who foiled the UN partition plan, but I think we can agree that all sides played their roles; the Jewish Yishuv, Husseini's Palestinian forces, Kaukji's forces, and the Egyptian, Jordanian, Syrian, Iraqi and Lebanese forces which participated in fighting in territory which had previously been under British rule. The third map (1949-1967) is misleading in its own way. 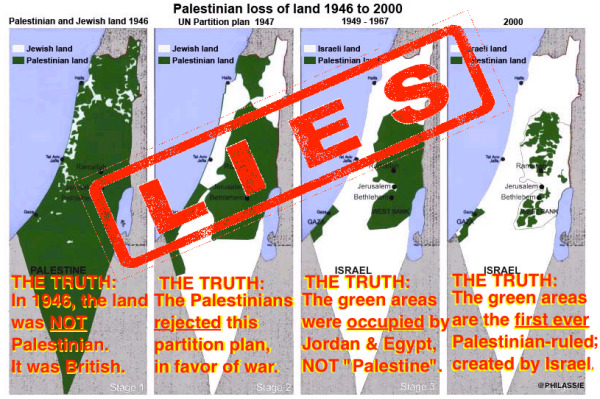 It depicts Israel in white, and two other un-named territories in uniform green, the same green the first two maps implied had been Palestinian territory. Of course, this does not conform to the historical reality. The Gaza section was controlled by Egypt, not the Palestinians, and rightfully should be defined as Egyptian-occupied Gaza. The larger green section was controlled by Jordan. Jordan annexed it and gave its population Jordanian citizenship, so I don't know if it was legally occupied or not: if so, it's status was probably similar to its status under Israeli rule after 1967: occupied, with settlers from the occupying country. If it wasn't occupied, then it was part of Jordan. (That's the source of the name "West Bank: the western half of Jordan). Either way, it can't be depicted as Palestine. You'll also note that this map shies away from dealing with private ownership, which was the theme of the first map. Had it shown private ownership it would have had to note that some of the territory inside Israel was owned by Palestinians, of course, but that no land inside Jordan was accepted as being owned by Jews, even though in some places their ownership had never been rescinded in anything that might resemble due process. Finally, the fourth map. For the first time in the series, there is now a type of Palestinian rule – in all of Gaza, and on the West Bank. Let's set aside the distinction between Hamas rule in Gaza and PA rule on the West Bank. Less explicable is the cartographer's decision to pretend that the Palestinian writ runs only in Area A, with nary any mention of the larger Area B sections. As far as I understand the history, this map doesn't show a rump area of Palestinian rule, but on the contrary, it shows the emergence, for the first time ever, of a new entity, of and for Palestinians. Not a disappearing Palestine, but an emerging one! I suppose you may say I'm quibbling, and that in a territory which had a minority of Jews 150 years ago, there has emerged a state of foreigners which has thwarted the emergence of a state of the original population. This, of course, is true. The tragedy of the Israeli-Palestinian conflict is that both sides are right, and both have legitimate claims on the same tiny piece of land. Most of us think that the only way to resolve the conflict is for each side to reconcile itself to the loss of important parts of the territory so that the other side will have room for their national state. As to why this hasn't yet happened, you and I probably disagree. We may also not agree on the details of how the partition ought to be done. Yet those are legitimate issues which need to be resolved in negotiations. The maps you've published, on the other hand, tell a different story: that Israel is purposefully pushing out the Palestinians so as to have the entire land for itself. This is not true, which explains why in order to make the claim the maps need to be so sloppy with the facts. Finally, a note on projection. I never cease to be surprised by Americans, Canadians, Australians or New Zealanders who feel they have a moral right to condemn the Jews for migrating to another land and pushing aside the natives. Surely the Jewish case for moving to the land of their history is vastly better than the case of Europeans moving to continents they had no history in. Over time, however, I've begun to notice that such critics of the Jews assume, perhaps subconsciously, that the behavior of the Jews must by necessity follow the pattern of their own forebears: total dismissal of their common humanity with the natives they're pushing aside, followed by near-total dispossession. This, however, is a complex of the critics, and has very little to do with the Jews.